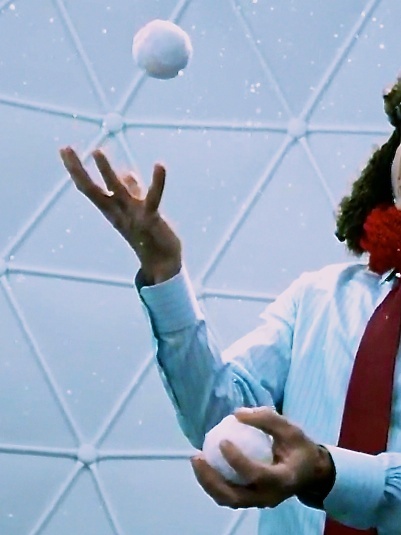 There are worse ways to spend 10 minutes than juggling in Google’s Winter Wonderlab. Plus you get your very own YouTube video to share. But what can you do if you want to immortalize the memory? Should you find yourself with a spare hour in New York City over the holidays, you absolutely must pass through Bryant Park on 42nd and 6th Ave.
There’s the ice skating rink going as well as the pop-up shops and dessert kiosks. Who knew walking through a park could be so much fun?! ‘Winter Wonderlab,’ featuring their Nexus 7 tablets and Chromebooks. In the center of their pop-up store is a high-speed photo studio inside a giant snow globe. In it, they shoot a slow motion video of you with a moving camera on a track. The result is a wicked cool 20-second sequence of you having fun in the globe, surrounded by fake falling snow. Then, they download the file, and you’re invited to customize your mini movie with music and distribute it via one of their Nexus tablets, conveniently waiting for you in the pop-up store. And then go buy one. I’ve got to admit, their marketing tactic was rather compelling. And I’m also not embarrassed to say I kind of liked my corny little video from their Winter Wonderlab. The Google folks even provided me with my own URL to call up my cinematic moment, which conveniently lives as a YouTube video, housed in a Google Winter Wonderlab wrapper. But you can also click on the video itself and call up the original YouTube page where the video lives. Can You Keep your Snow Globe Joy Alive Forever? Sure I’ve got a link to forward for anyone to watch. And the link is always there for me, right? Winter Wonderlab open in the digital space. The problem is you can’t download YouTube videos. Google understandably doesn’t offer that functionality. YouTube officially frowns on the downloading of their videos through other technologies. This would break their terms of service. Plus, you don’t own the copyright on someone else’s content. YouTube does suggest one exception if you are trying to download your own content. So in this particular case I wanted to download specific imagery of Barrett juggling Styrofoam snowballs. But I didn’t create the actual content… Google did. Hmmmm… How gray is that? So I’ll simply say I may have considered the following investigative mission. I quickly realized I wasn’t alone in this intellectual query. Digital Trends has a good story on available options out there. And CNET has its own thoughts on the issue. And after doing a little research, I saw it’s often mentioned as a major player in this space. KeepVid’s usability is pretty straightforward. There’s only one annoying pothole to avoid. Don’t click on the ‘Download’ or ‘Play Now’ buttons on the top of the page. Those misdirect you to advertisements. PCWorld has posted this useful ‘how-to video’ on using KeepVid. A Decision for Another Day? A noggin rumination, if you will. That there are effective ways to force video content off a webpage is not a happy reality for many multimedia-hosting websites. If you upload your own multimedia content into the universe, there are always ways for others to get it. Now, we’ve come full circle. Now, go make your own snow globe video and have some fun!